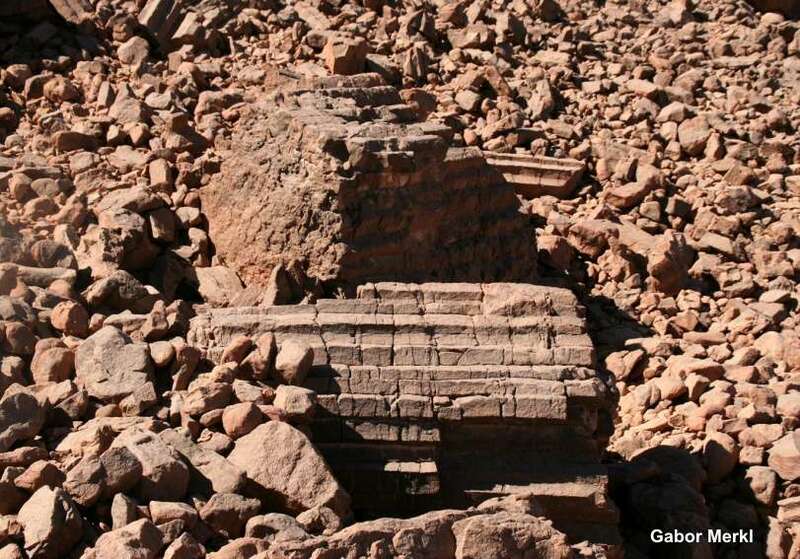 Also for a geologist mysterious and up to now not seen are the discovered and photographed structures in the Jebel Uweinat by Andras Zboray, Hungary, in 2008. 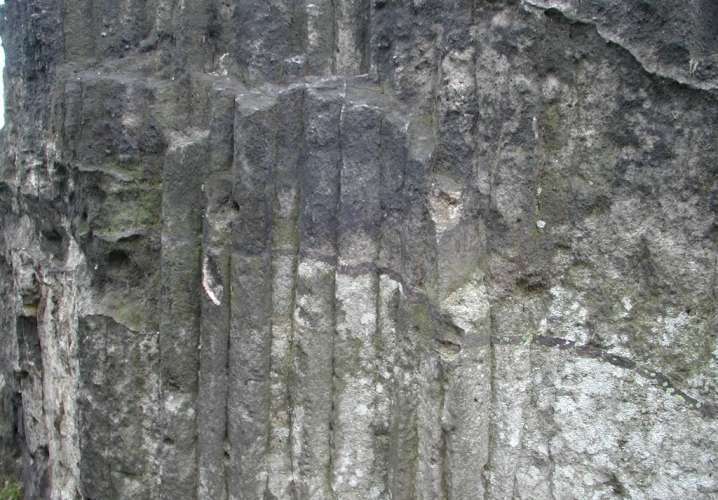 Surprisingly, there are no columns of basalt or other eruptive material. 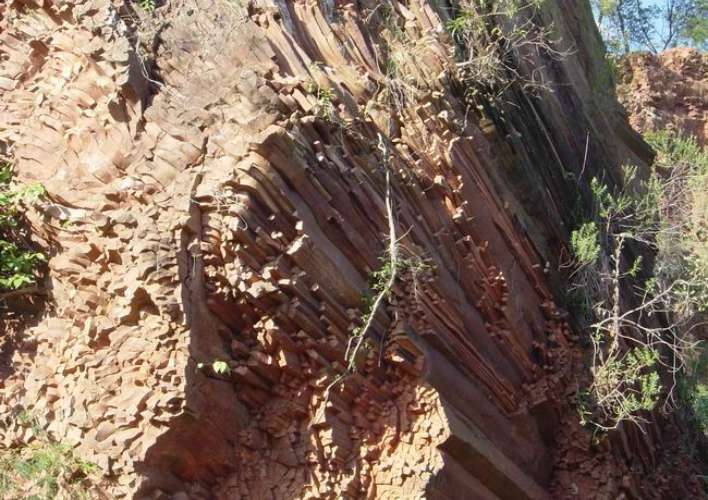 The sandstone is splitted like basalt columns. 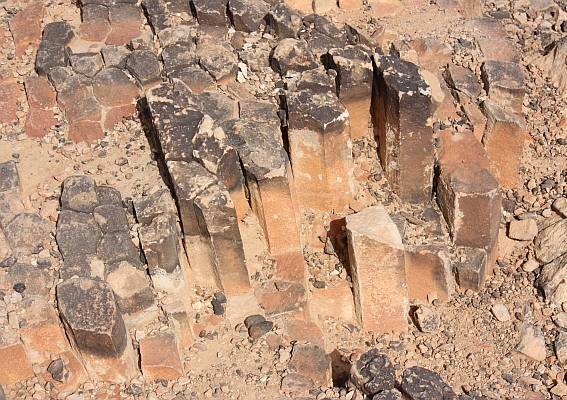 The columns have a triangular to hexagonal cross section. 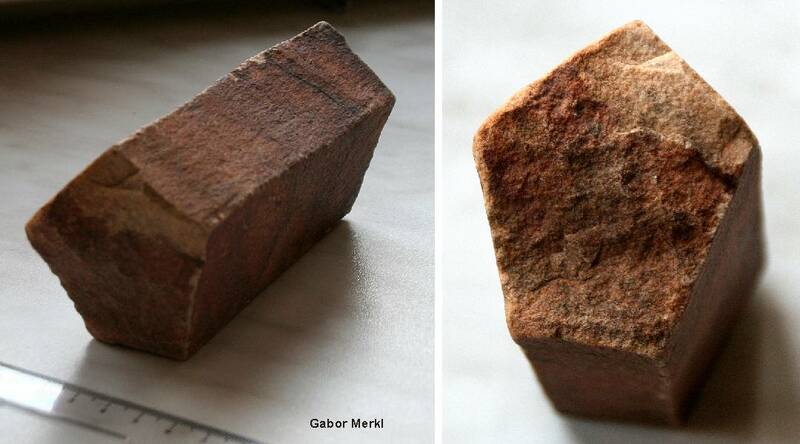 They have a different diameter and it is to find not the root. 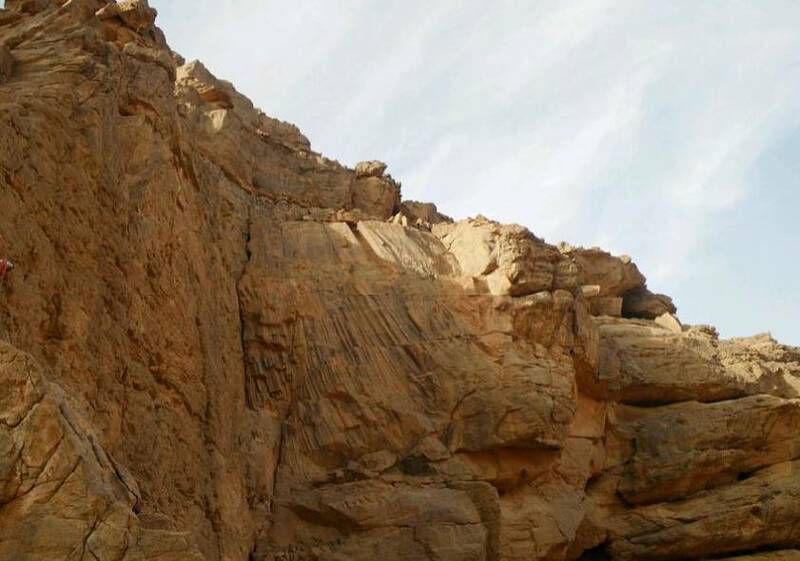 They seem to be inclosed in the massive sandstone formation. 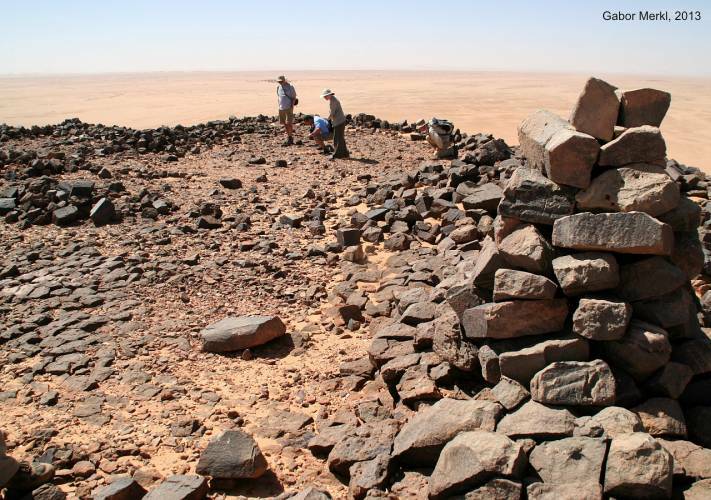 Normal bedded sandstones were observed both above and below this peculiar structure. 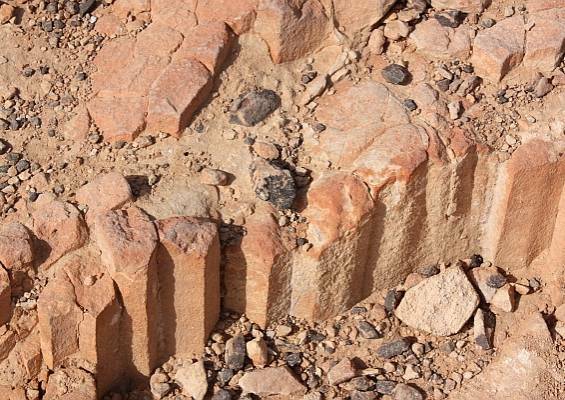 The internal structure of the sandstones is apparently unchanged. 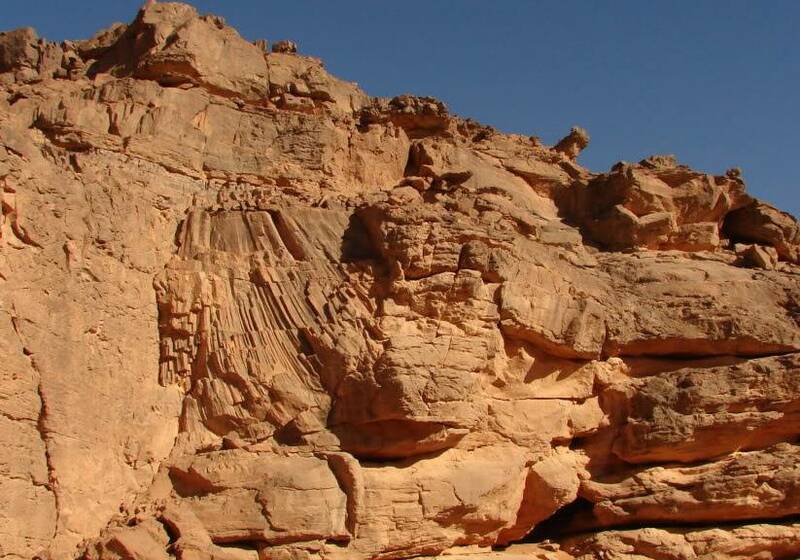 While there are several "basaltic" plugs and dykes in the area, but here is not visible a basalt in direct contact with this sandstone columns. 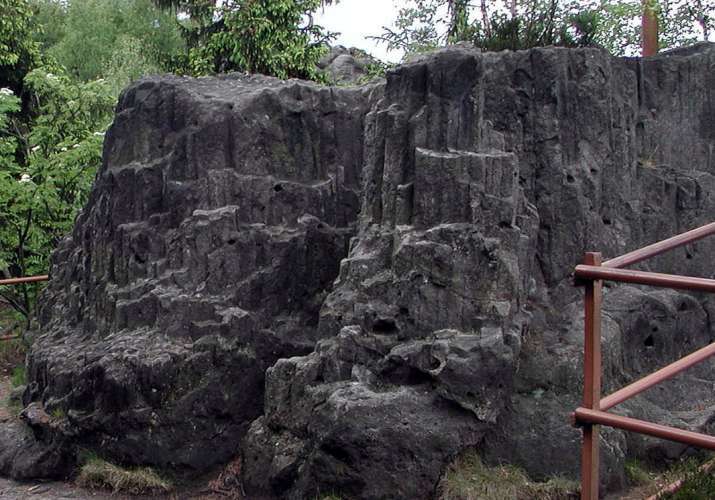 Basalt columns are usually of regular hexagonal cross section. 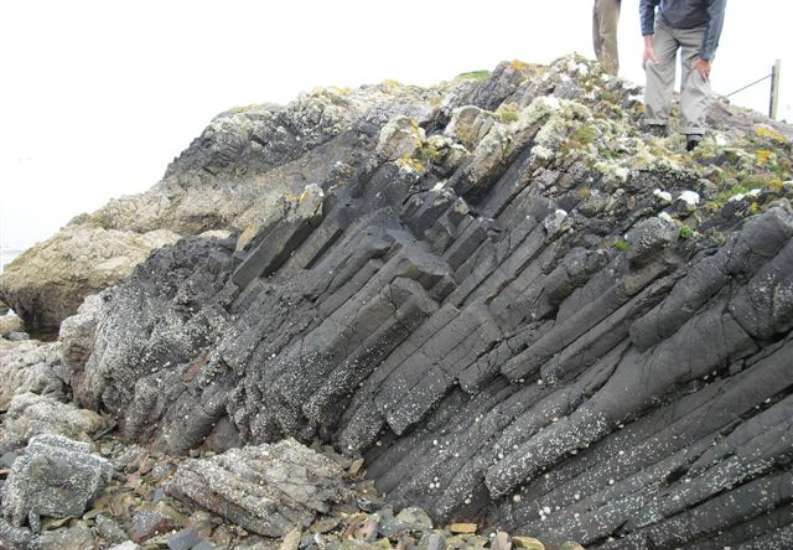 The hexagonal cross-section of basalt is formed during the cooling due to shrinkage. 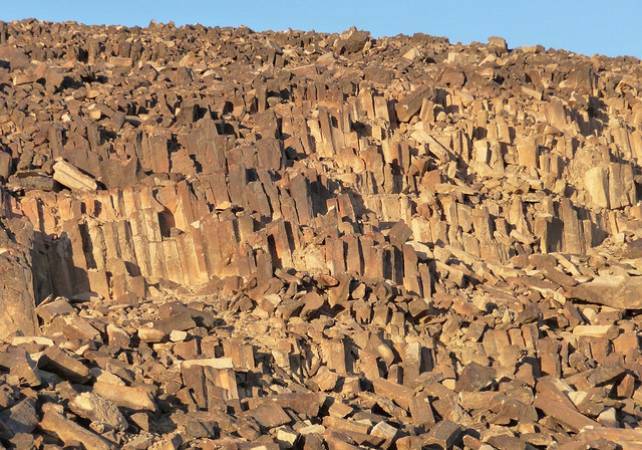 So far it is known that columnar sandstones were found only in direct contact with basalts. 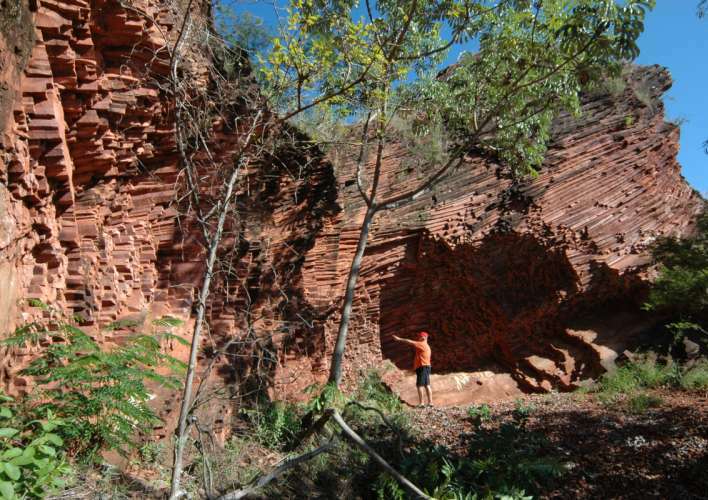 However, then the sandstones are fritted and highly mineralized. 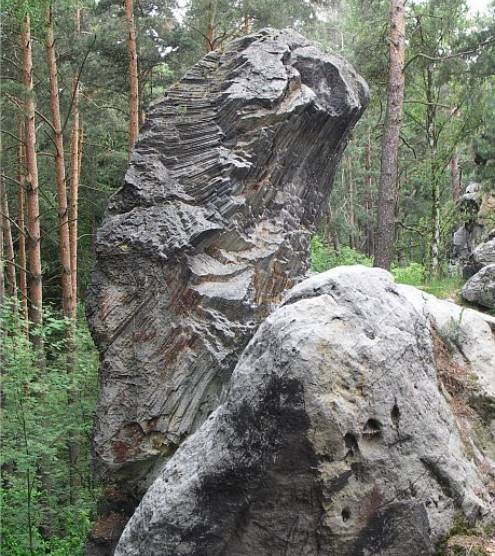 This is here not to see at first glance (without pyromethamorphism). 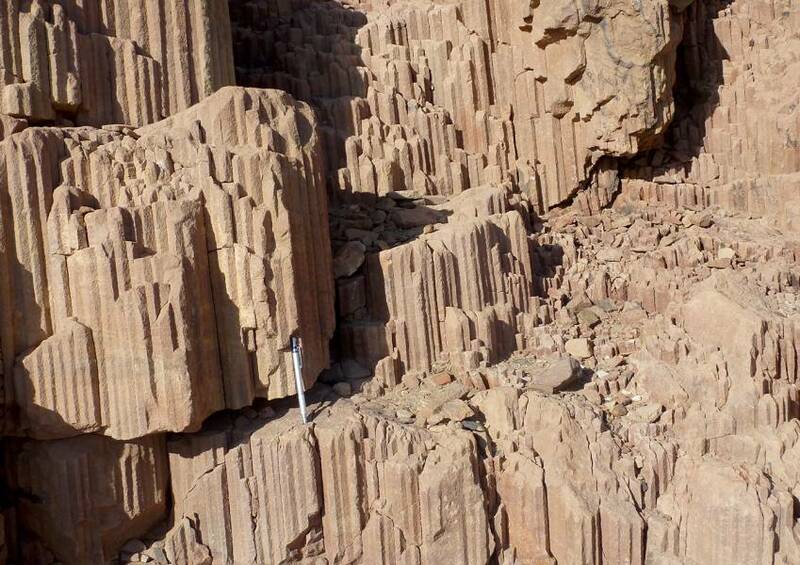 I think that such columnar structures in the sandstones can only be the result of shock waves, generated by movements in a magma-chamber. 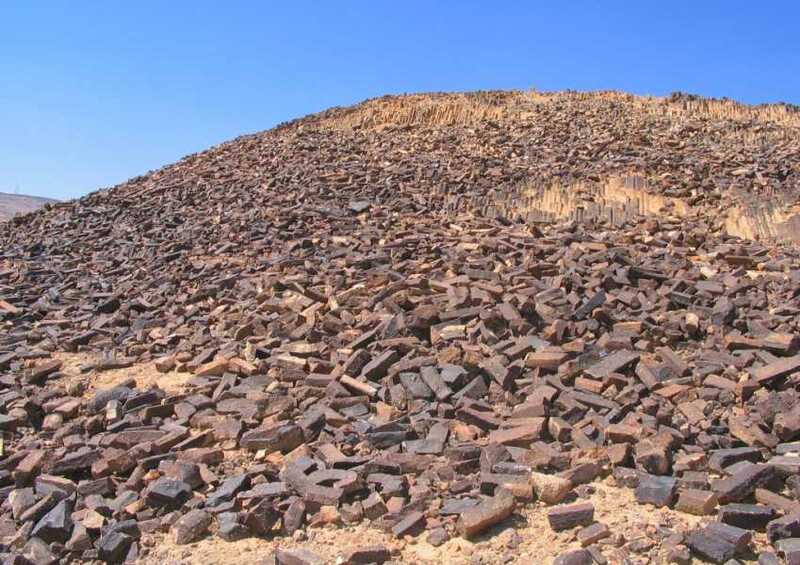 I am convinced, this is also true for the well-known “Shatter-Cones”. 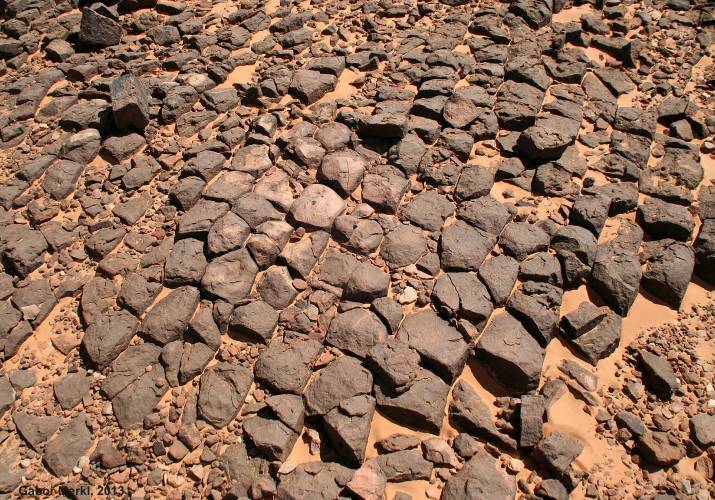 These were found most in proximity of large so-named impact craters. But they are in truth often craters of volcanoes or super-volcanoes. 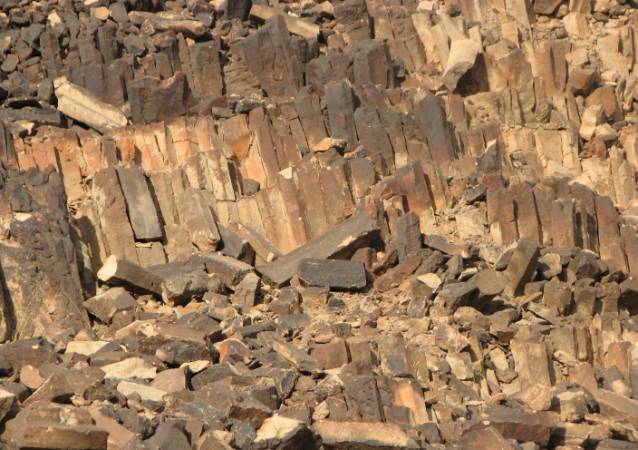 But, no of the existing hypotheses for the formation of shatter-cones currently is able satisfactory explain the characteristics of this fracturing phenomenon. 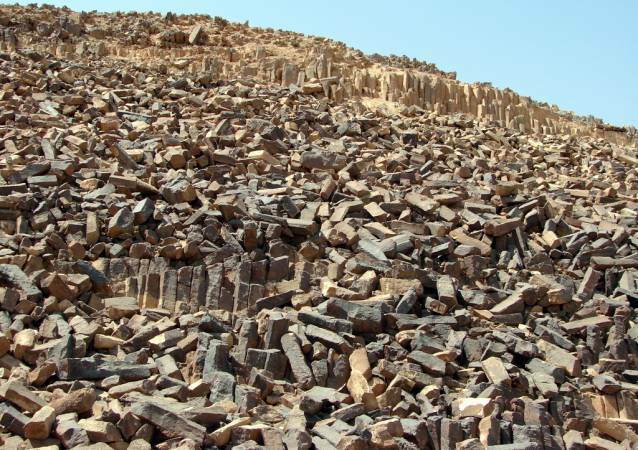 Columnar sandstones were found on further places in the Jebel Uweinat, Gilf Kebir crater field (Egypt) and Jabal Arkenu (Libya). 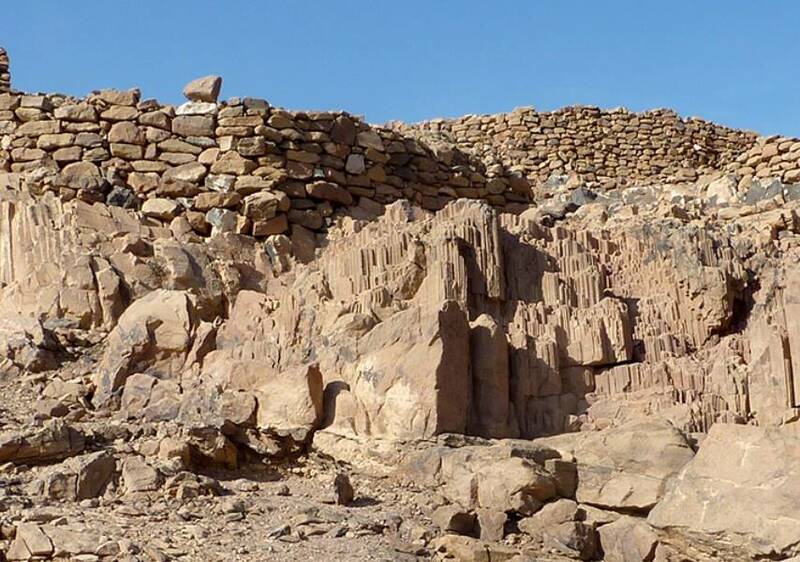 "After having read your article on mysterious columnar sandstone structures in Jebel Uweinat I realised that I found a similar structure in Jabal Arkenu, when I was in the mountain with Andras Zboray in November 2010. 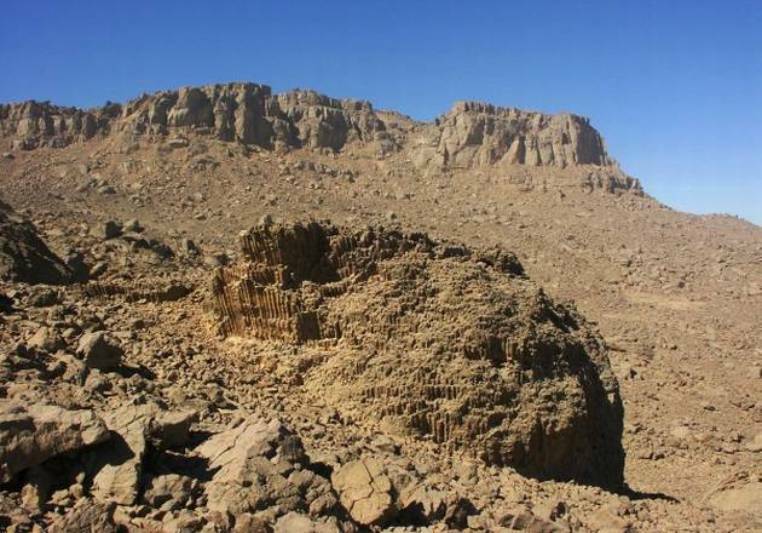 Also in 2009 we found the same phenomenon on a low sandstone hill north-east of Jebel Uweinat and also on the flank of Uweinat when we went up to the top of the mountain in the same trip." 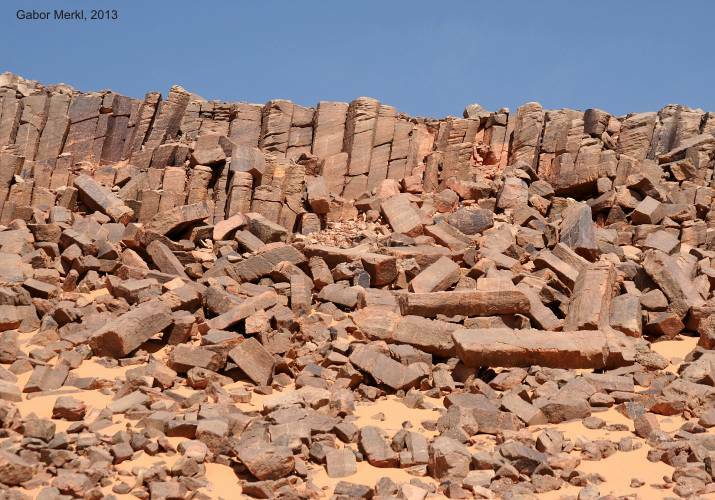 Meanwhile I have recherched further examples of columnar jointed sandstones. 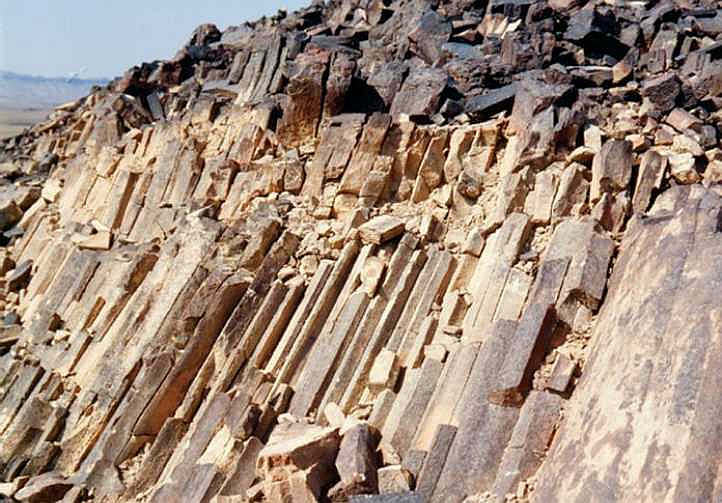 They are distributed worldwide (but rare), they are always linked with volcanic structures, and are more or less changed by quartzitization. 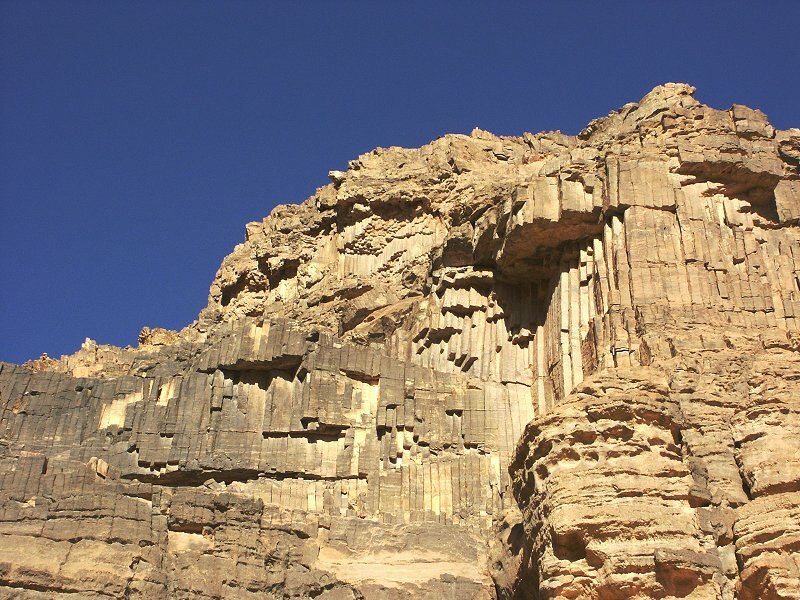 The genesis of such columnar structures in the sandstones is explained in several publications. 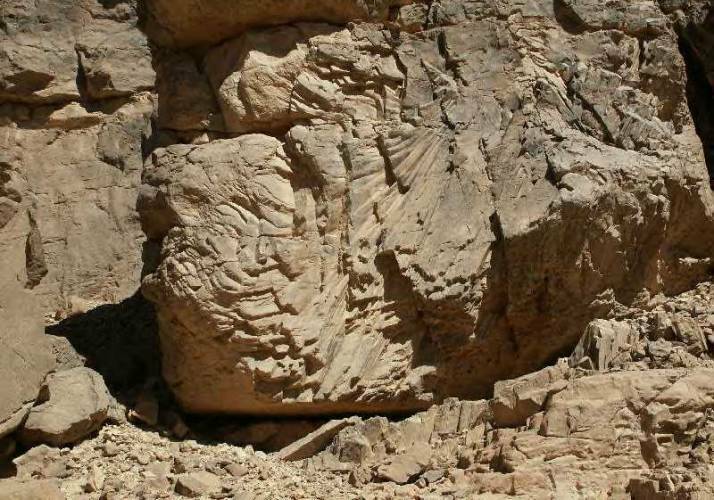 "A hill of Mesozoic sandstone in the Ramon Makhtesh, an eroded anticlyne structure in the Negev desert, consists of prismatic pillars of hard quartzite, with 3–8 facets, which are 3–12 cm wide. 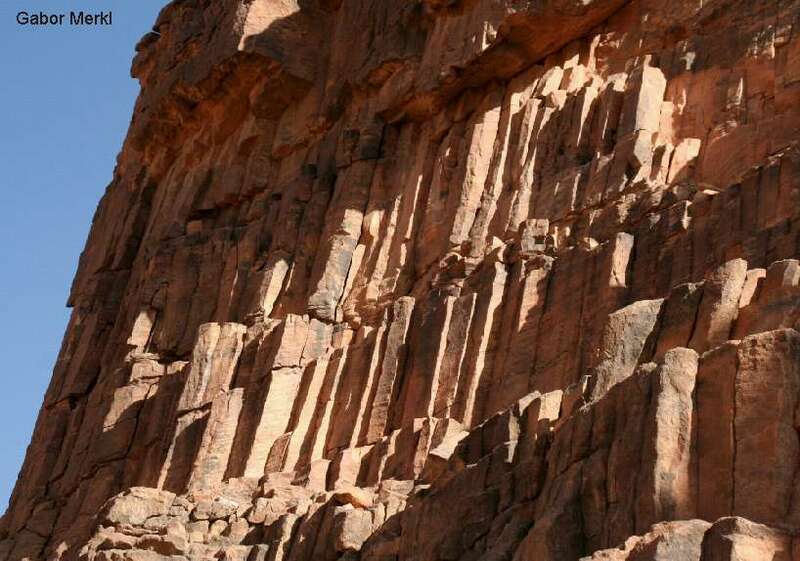 The pillars occur in beds with a outcropping along 60 m. They occur near emplaced magmatic bodies of Basanite, but they have no direct contact with the outflows of this Basanite, so it has been suggested that these quartzitic pillars were formed by hot fluids that accompanied the igneous intrusions infiltrating into the sandstone." Victoria Alonso, Dep. 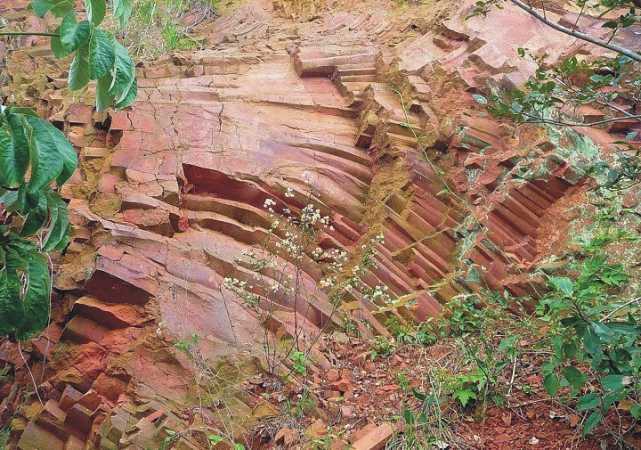 Geology of Univ. 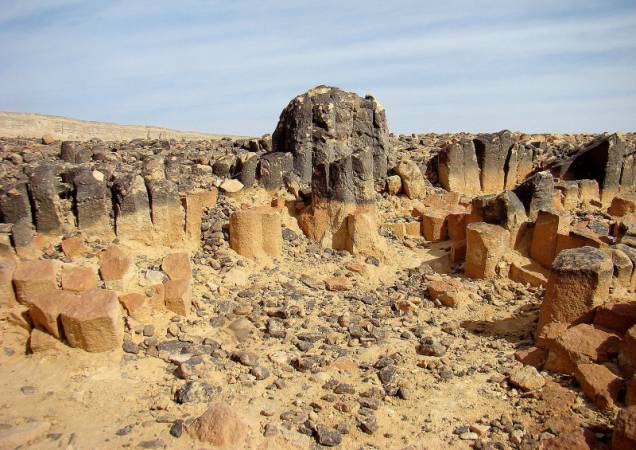 Oviedo / Spain, in 2011 visited such non-metamorphosed Upper Cretaceous sandstone columns in northern Sudan. 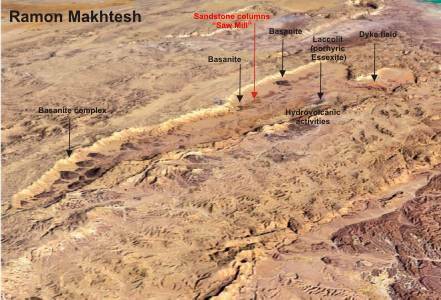 They are located east of the Nile river in the Jebel Wahaaba, (19.7°N / 30.37°E). Three photos she have provided to me on January 09, 2018. 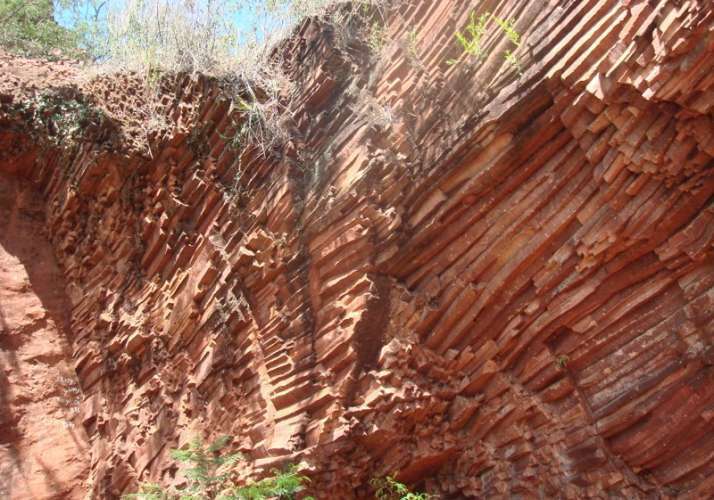 "The columnar joints of Aregua, located in the western segment of the Asuncion Rift, Eastern Paraguay, occur in reddish eolian sandstones and are disposed orthogonally at both sides and terminations of the nephelinite dyke. 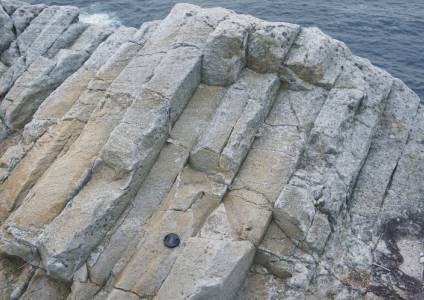 Column ranges from 3 to 10 cm in diameter, reaching 15 m in length, and the polygonal forms have four to seven sides, being the pentagonal predominant. 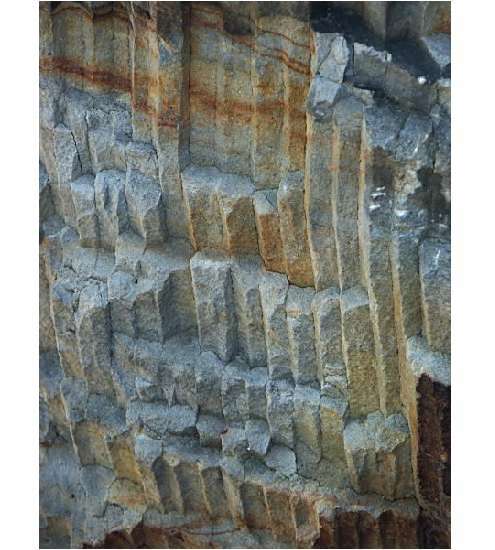 Parallel and regularly spaced one bands with relief in steps occur perpendicularly to the columns elongation. 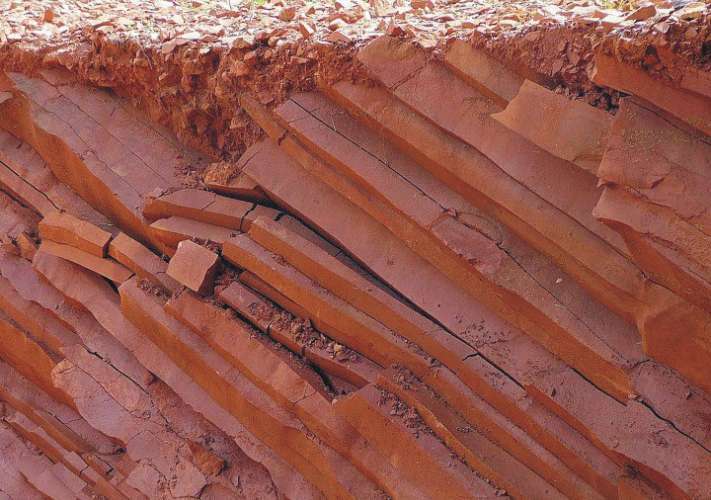 In comparison with the basaltic joints, the sandstone columns of Aregua show a moderately mature pattern, far from the typically hexagonal pattern. 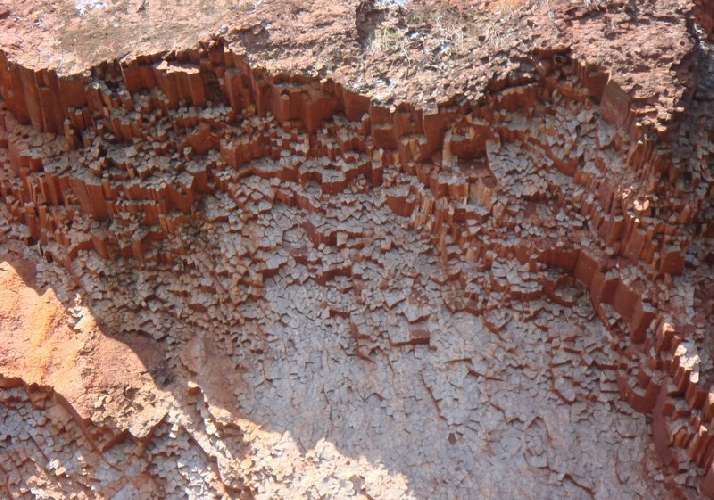 The textural characteristics of the sandstones near the nephelinite dyke, including the abundant presence of fluid trapped as inclusions, suggest that initial silica-rich cement is composed of a low crystallinity phase, formed quickly in loco under conditions of intense dissolution and reprecipitation of quartz. 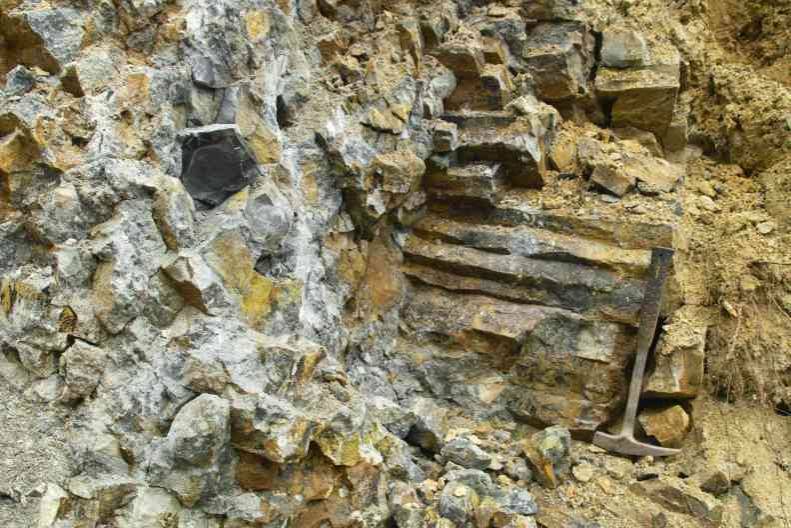 A hydrovolcanic event seems to be the most probable process to promote a rapid and localized dissolution of quartz in addition to the abrupt increasing of temperature and/or pH in the pore waters. 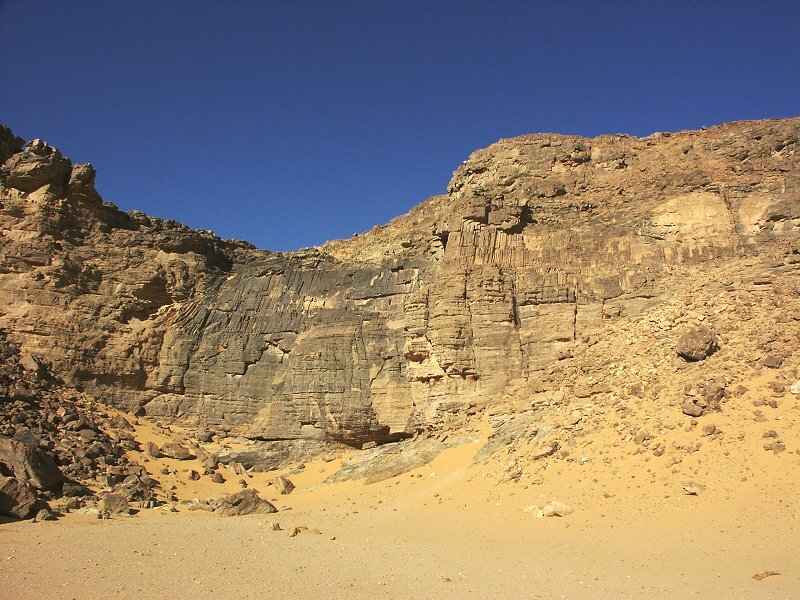 The interstitial aqueous solutions in the sandstones were heated as consequence of magma injection causing partial dissolution of quartz grains, addition of silica to the interstitial liquid phase and further reprecipitation during cooling. 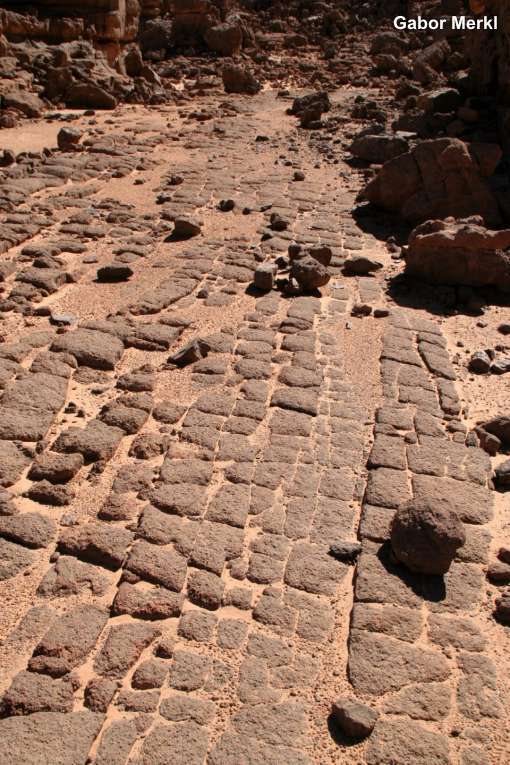 Rapid cooling and severe thermomechanical contraction lead to nucleation and propagation of the cracks. 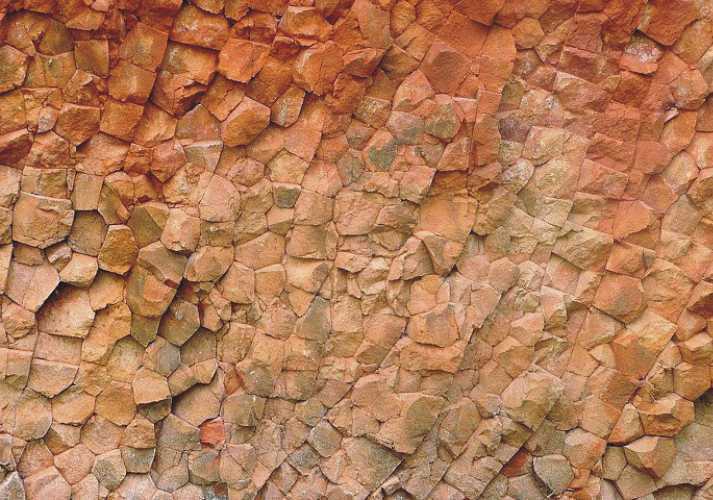 Increasing of internal tensions in the sandstone has caused the nucleation of polygons and consequent individualization of prisms interconnected by a system of joints. 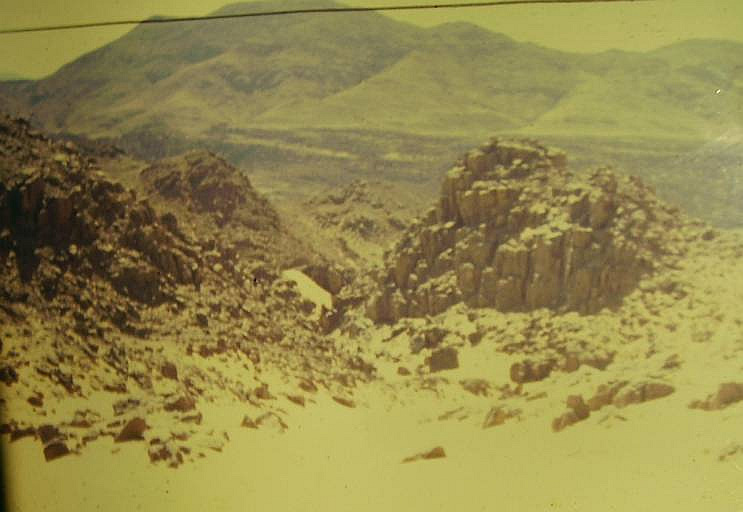 Joints acted firstly on isotherm surfaces of less temperature and later on successive adjacent planes towards the dyke heat source. 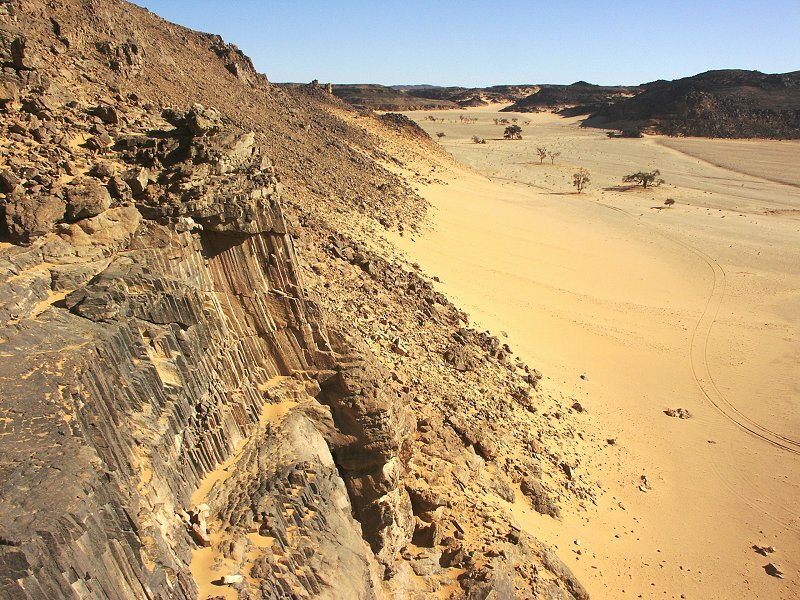 Cracking initiated on the surface of lower temperature isotherm and propagated towards the dyke following heat flow lines. 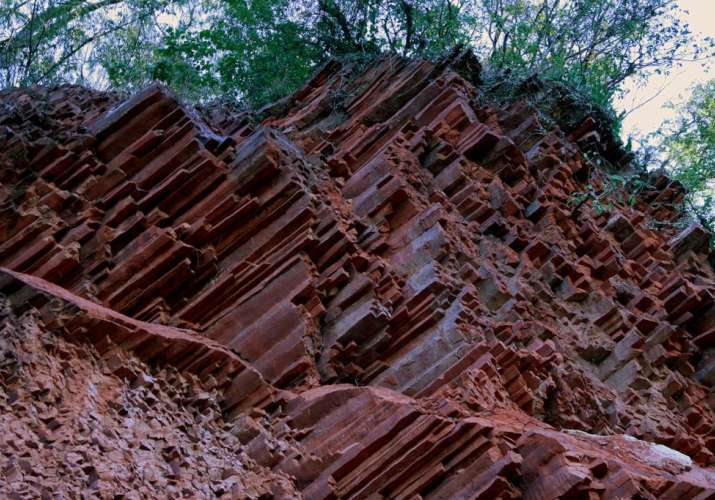 The proposed mechanism for the origin of columnar joints in sandstones of Aregua differs in terms of velocity from those admitted for the formation of similar features in igneous rocks, where the cells of heat convection can act for a long timeinterval over all the extension of the magmatic body." 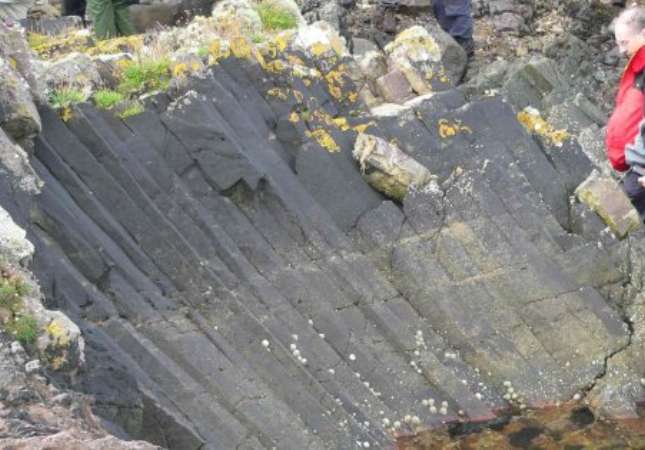 "Columnar joints, resembling those in igneous rocks, are present in Devonian and Early Carboniferous sandstones at two localities on the Island of Bute in southwestern Scotland. 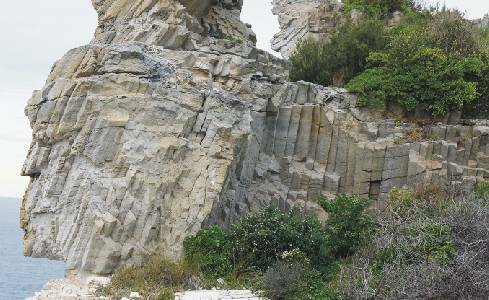 New data concerning field relations and geochemical changes constrain processes responsible for generation of columnar fracture patterns in sedimentary rocks. 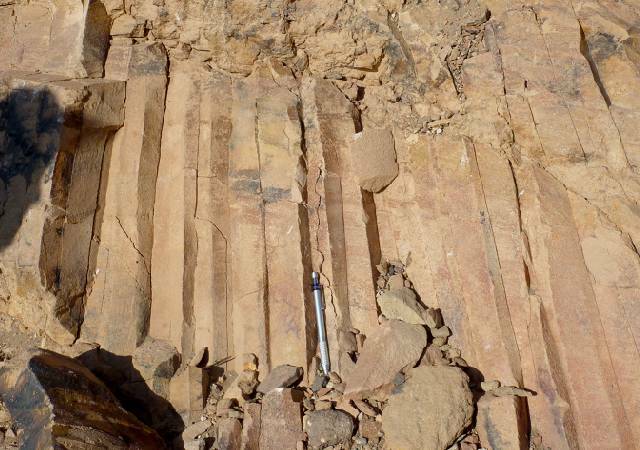 The columns are mostly normal to bedding and occur at several discrete stratigraphic levels. 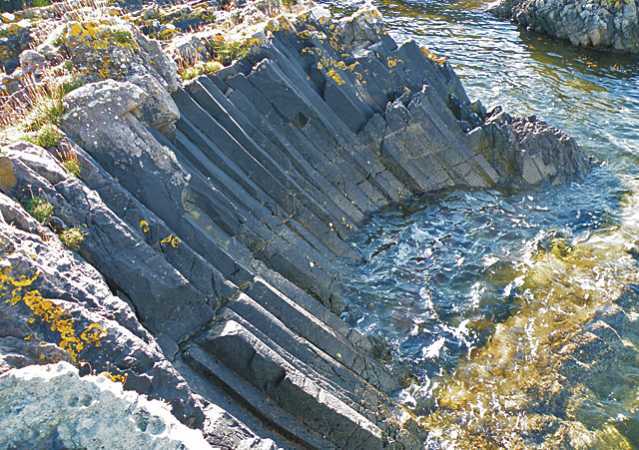 The host rocks are cut by Early Carboniferous volcanic necks or plugs, which acted as heat sources, but development of columnar jointing was strongly controlled by small sills and dikes of a recessive, purple, fine-grained rock. 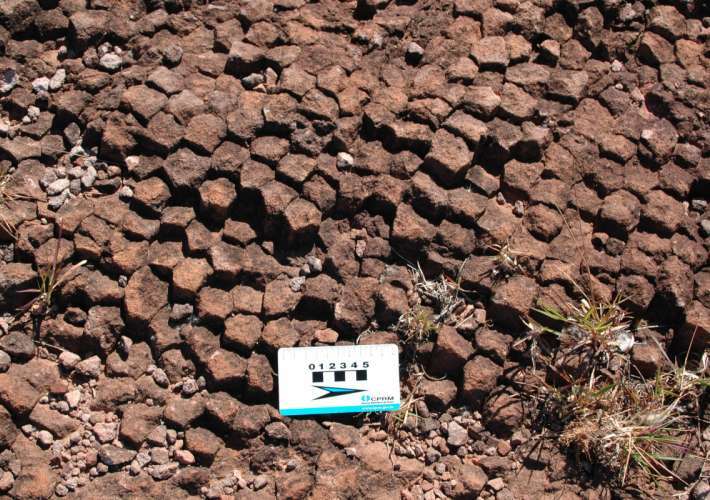 Geochemistry of these rocks points to an igneous origin. 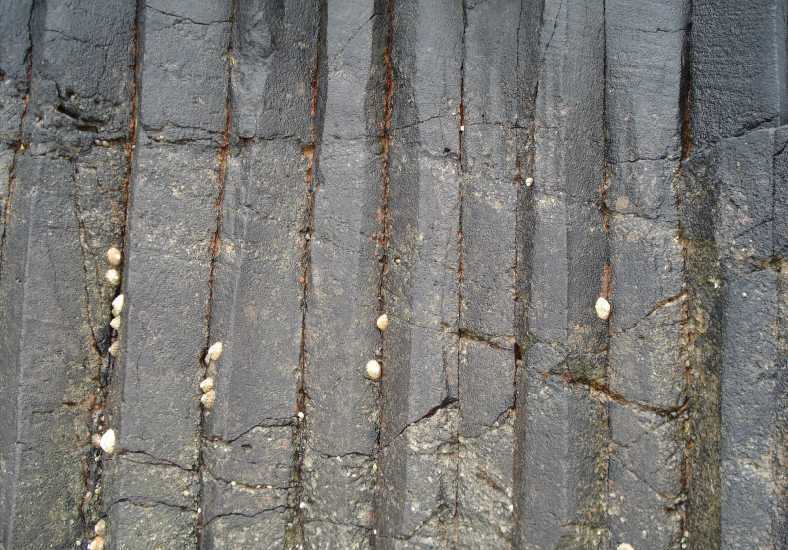 Where contacts are exposed, columnar joints appear above subconcordant intrusions and disappear upward. 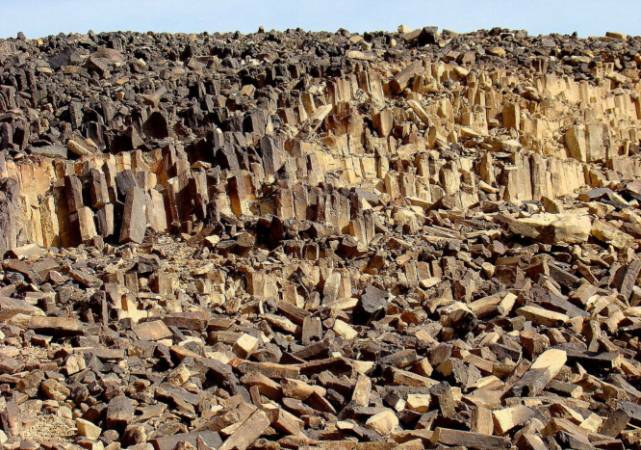 The lowest parts of the columnar-jointed sandstones are Si depleted and enriched in Ca, Mg, Fe, Al, rare earth elements (REEs), and some base metals. 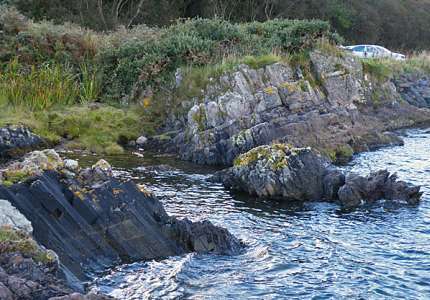 REE patterns from columnar-jointed sandstones near contacts with intrusions resemble those of the igneous rocks, probably as a result of hydrothermal activity. 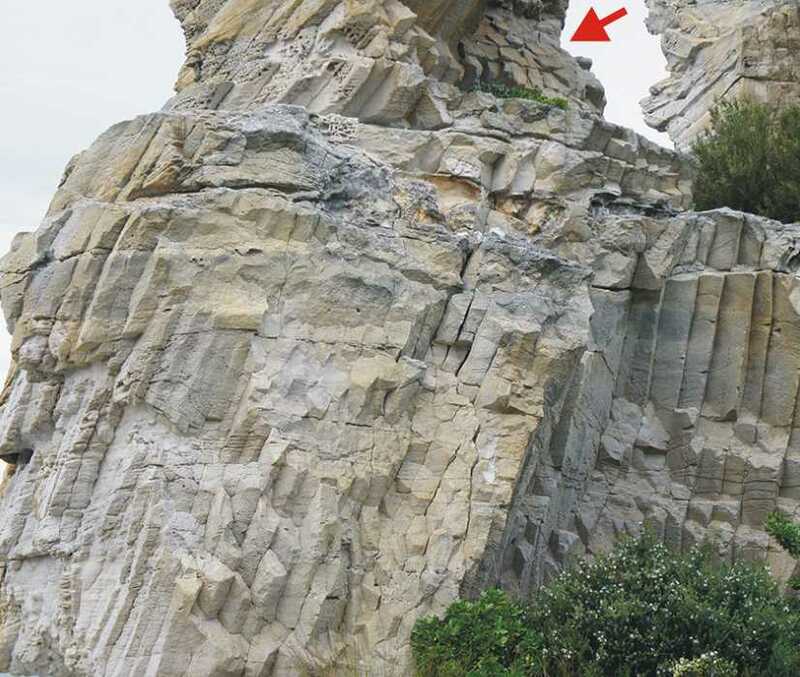 Because most of the columns are approximately normal to bedding, intrusion probably took place before folding of the host rocks and possibly before complete consolidation." 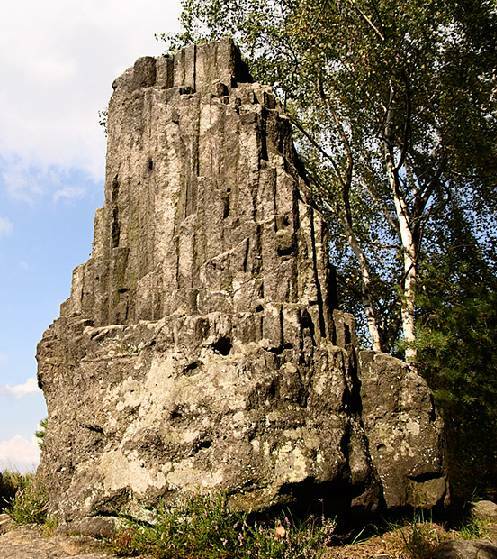 "In the area of the Zittau Mountains (southeast corner of Germany), the geological feature of columnar sandstone is known. 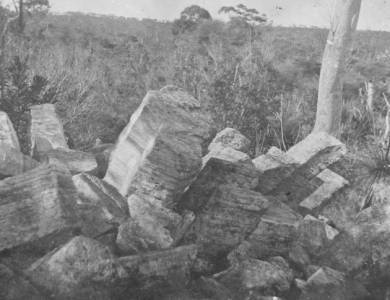 For the sandstone atypical column-structures have a diameter up to 15 centimeters and stand perpendicular bundled on a massive sandstone block. 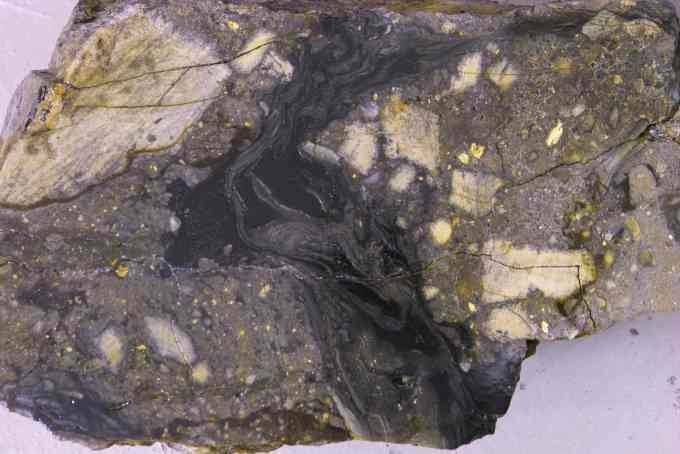 Cause is the widespread Tertiary volcanism. 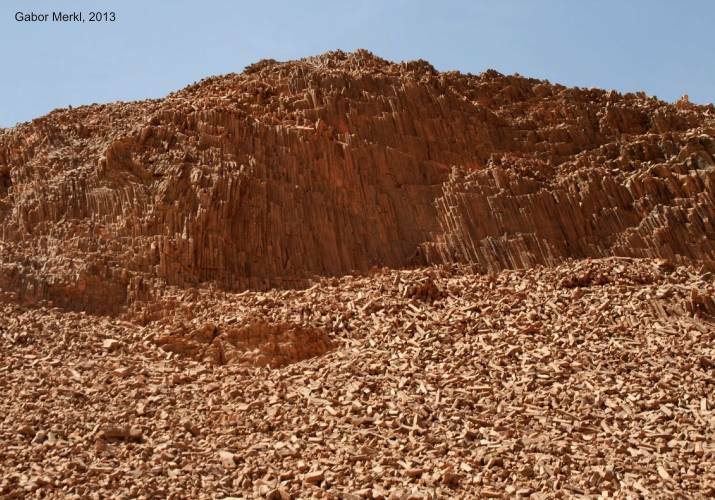 In its wake the habitus of the Cretaceous sandstones was changed. 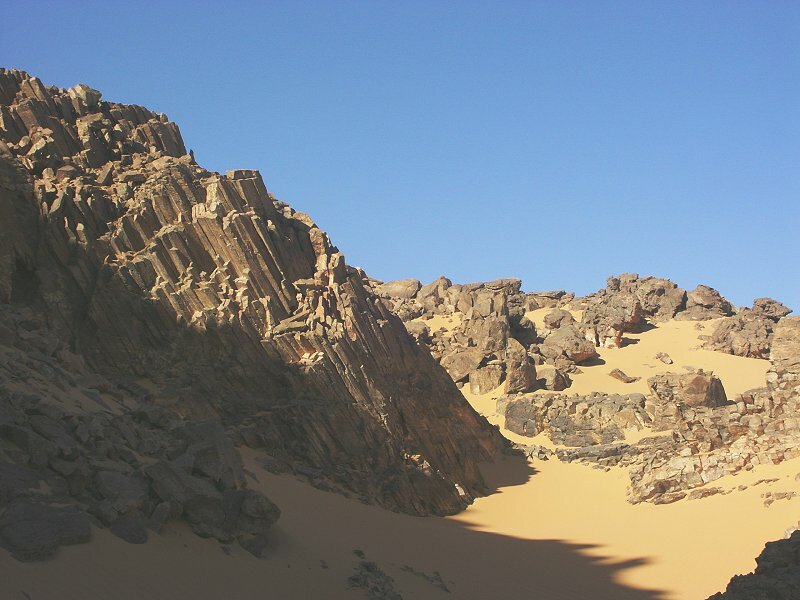 The material was exposed thermal processes (contact with magma and thermal solutions), which led to a fritting (marginal melting of mineral grains). 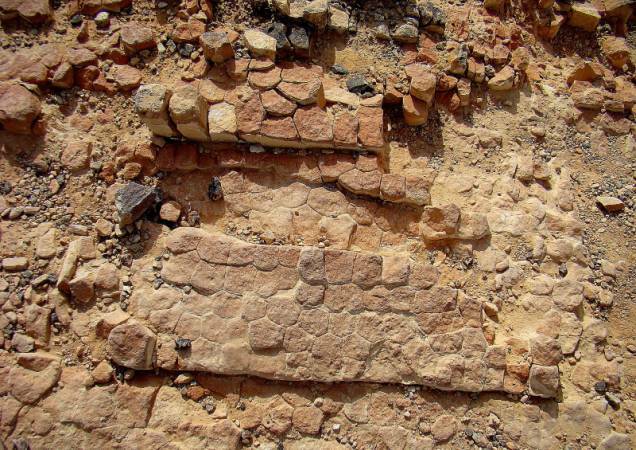 The sandstone retained its porosity, but its hardness was increased." 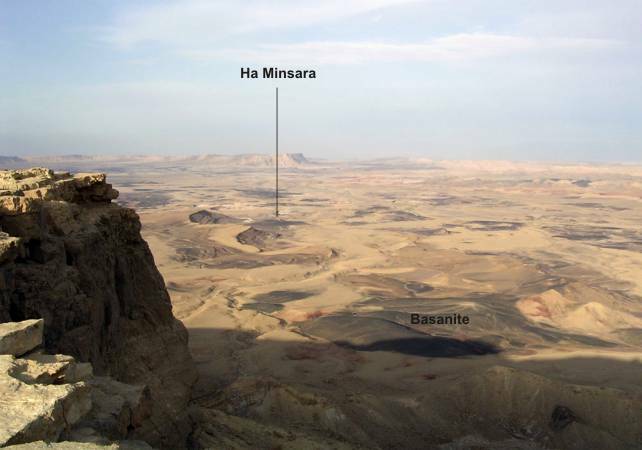 Alexander Glass, Lecturer and Director of Undergraduate Studies, Duke University, Durham, USA, sent me just this photos. 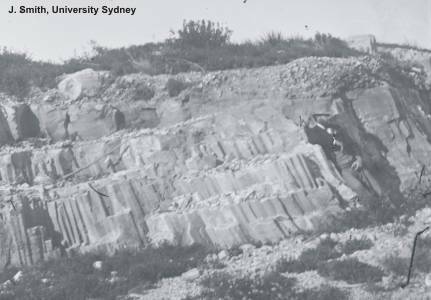 Both show a columnar sandstone formation from the Bondi Beach, near Sydney, Australia. 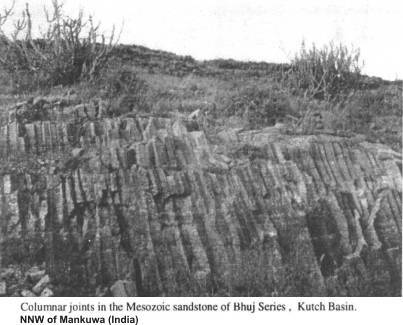 This Triassic sandstone is placed near a volcanic neck. 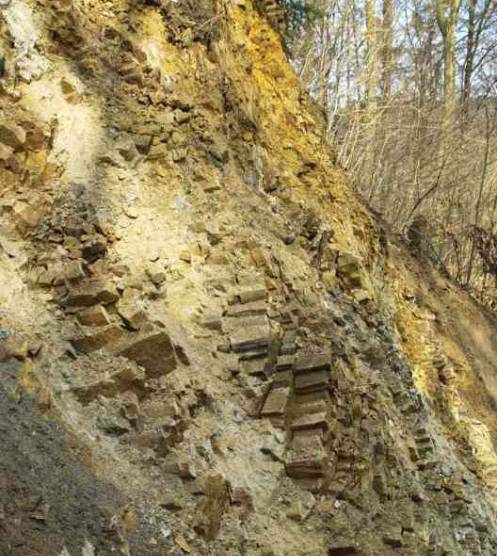 Im Tertiar stiegen basaltische Schmelzen in den hier viele hundert Meter mächtigen Sandstein auf. 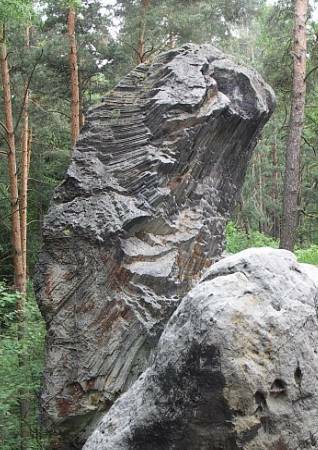 Der Sandstein wurde mechanisch brekziiert, angeschmolzen und es bildete sich im direkten Kontakt ein braunes bis graues Gesteinsglas, welches als Buchit, bezeichnet wird. 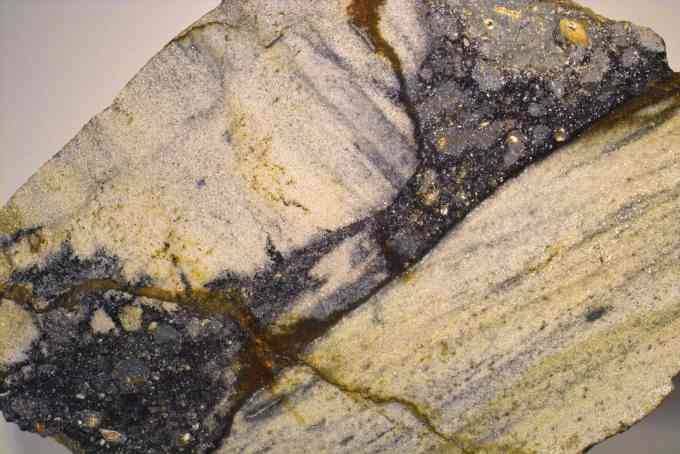 Der unscheinbare Buchit enthält zahlreiche Mineralneubildungen. 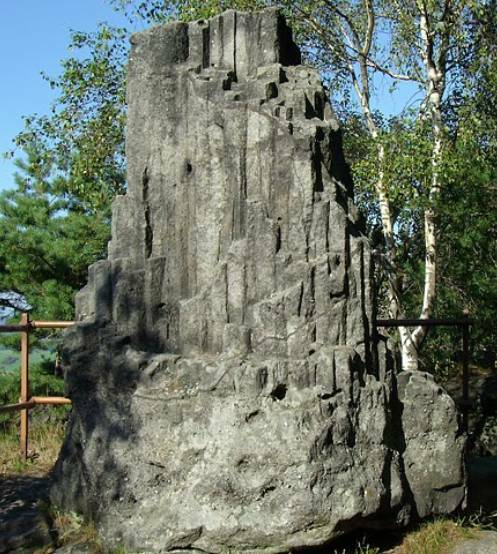 In etwas größerer Distanz wurde der Sandstein nur gefrittet, d. h. angeschmolzen, aber die Quarzkörner des Sandsteins sind noch sichtbar. 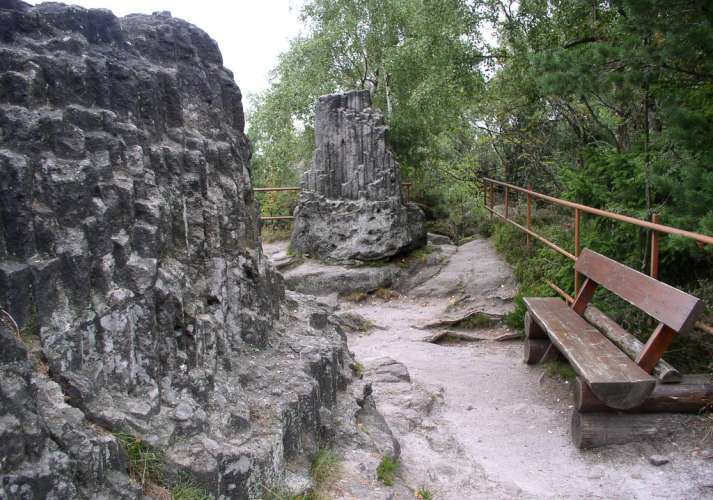 Beim langsamen Abkühlen bildeten sich Kontraktionsrisse, die den Sandstein zu einem polygonalen Muster zerlegten, so dass Sandstein-Säulchen enstanden, was sonst nur von den Basalten oder Rhyolithen bekannt ist. Dies ist eine seltene Besonderheit. Dabei stehen die Säulen senkrecht zur Abkühlungsfläche. 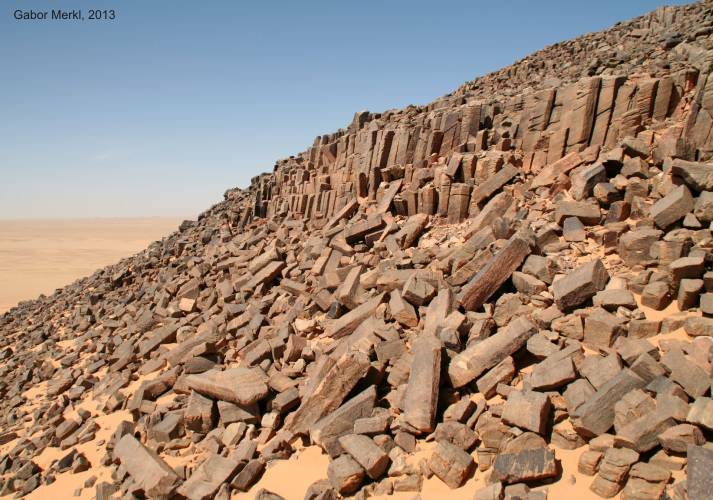 I think the columnar-jointed sandstones were created by different ways. 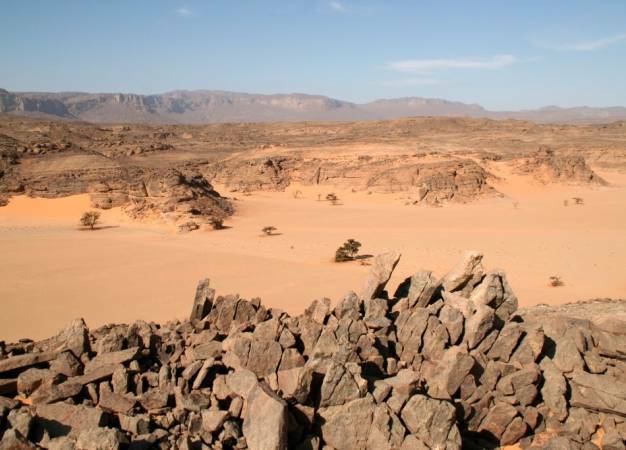 A second possibility of this is the simple interaction of heating and cooling. I think mostly sites listed on my homepage (including Ramon Crater) belong to the second group when the sandstone columns are partly or total quartzitized. 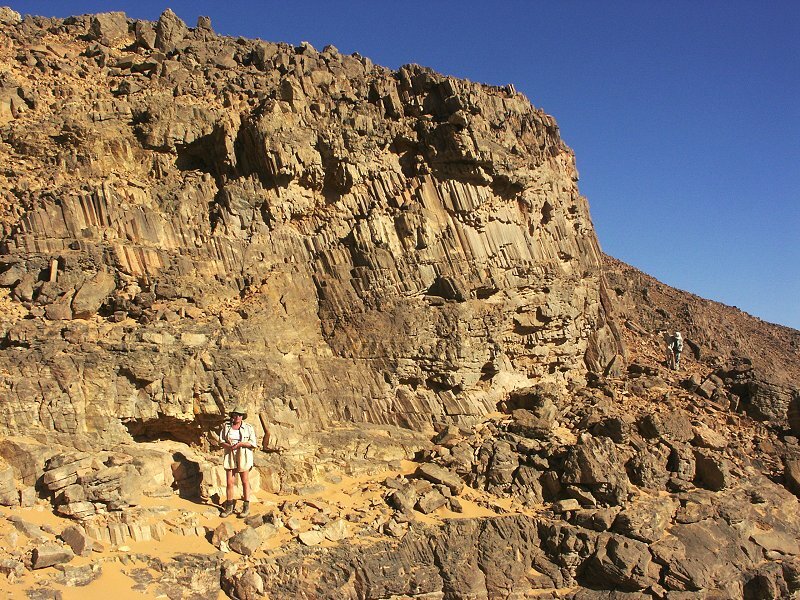 Both have nothing to do with the columnar-jointed sandstone in the Jebel Uweinat. 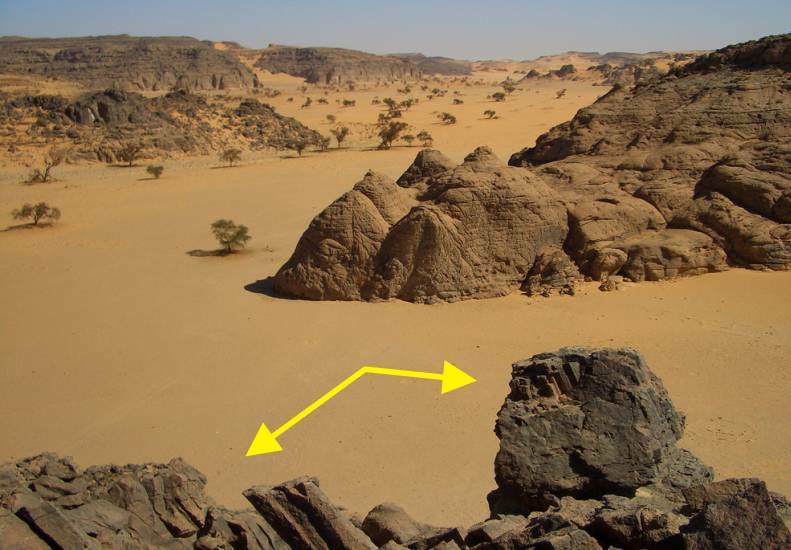 There were widespread subvolcanic activities (plugs, dykes) in this region (three-country corner Egypt/Sudan/Libya), but the columns had no contact with such structures, were not affected by heat, and are unchanged in their consistency. 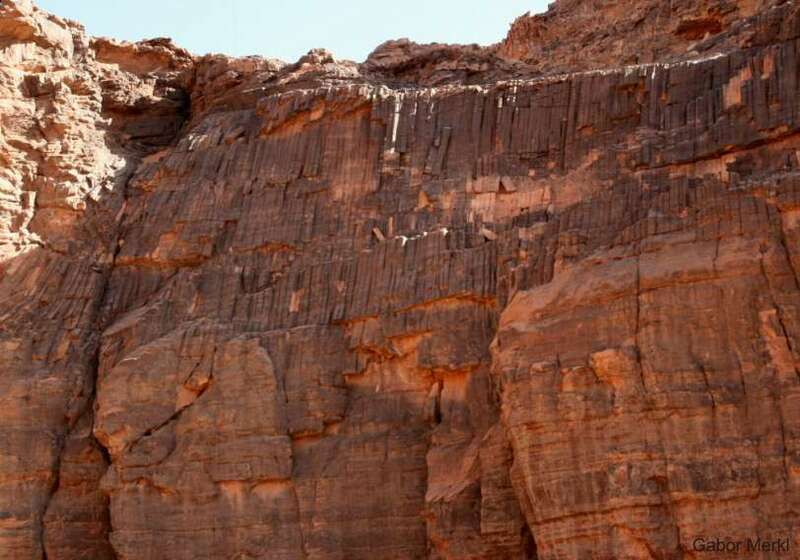 The columnar-jointed sandstones stand abruptly in the steep walls of valleys, apparently without roots on undisturbed sandstone. 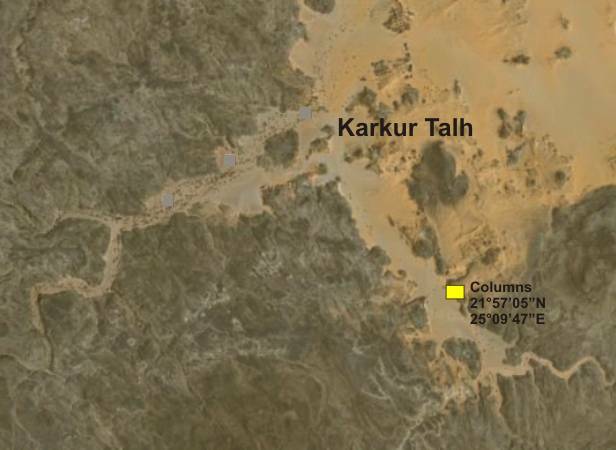 The creation of this third kind of columns is mysterious. It is sure that no intrusions are in the vicinity. 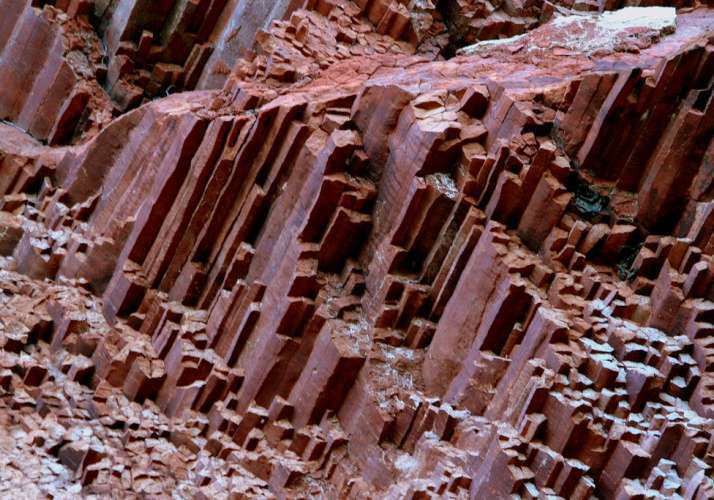 So I am of the opinion that such columns could created by vertical shock-like movements of magma from the underground.